How Do I Build a Tile Wall? The engine of the Honda HS622 snowblower uses oil just like any other type of small engine. This means that the oil in the snowblower will need to be changed before the start of winter each year. You can change the oil on a Honda HS622 snowblower by first making sure that you have the correct type of oil for the machine. 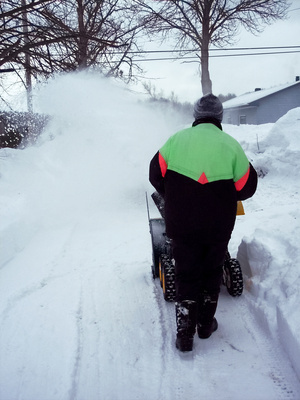 Take the key out of the ignition and set wood blocks behind the rear wheels to prevent the snowblower from moving. Locate the drain plug for the oil and place a drain pan on the floor below the plug. Remove the filler cap for the crankcase. Remove the drain plug using the 10mm wrench that was included with the tool kit for the machine. Wait while the oil drains from the crankcase and then re-tighten the drain plug. Add 5W-30 motor oil to the crankcase. Check the level of the oil by examining the dipstick. The machine can hold approximately .63 qt or just over ½ a quart of oil. Replace and tighten the filler cap when the crankcase has been filled with oil. Dispose of the used oil by taking it to a recycling center. You can also dispose of used oil by taking it to the nearest AutoZone. Changing the oil when the engine is warm will make the oil drain out of the crankcase faster.